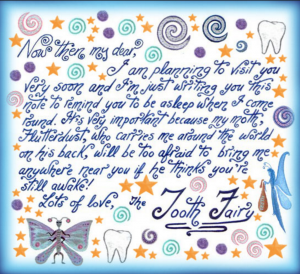 Have you ever seen the tooth fairy? She is very shy, so I doubt it. But she visits dentists around the world now and again. Dr Alex sees her once or twice a year but she stays only briefly to chat about children’s milk teeth. She is a busy fairy, collecting milk teeth from children all over the world, so she has a very busy schedule.